Advanced Practice Registered Nurses gain their knowledge and expertise through the rigorous Master of Science in Nursing (MSN) program. The specialized training helps registered nurses develop and apply advanced nursing principles to care for patients. The State of Nebraska licenses APRNs in four roles: Nurse Practitioner, Certified Registered Nurse Anesthetist, Clinical Nurse Specialist, and Certified Nurse Midwife. Advanced practice nurses, and nurse practitioners, in particular, help to fill the gap in primary care. In 2015, Nebraska elected to grant nurse practitioners full practice authority to meet the growing demands for primary care. The move not only expands healthcare access but also brings affordable care to those who need it most. Under the provision of the act, APRNs have the authority to diagnose and refer patients, order tests, and write prescriptions. 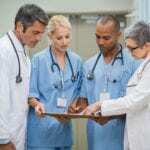 As the nursing workforce practices to their maximum capacity, they are better prepared to move into rural and underserved areas and increase access to primary care and deliver preventative care services. This level of care is especially critical to the senior population and those living with multiple chronic illnesses. The master’s of science degree in nursing prepares nurses to take a more active role in the delivery of healthcare and the shaping of health policy. The curriculum includes theory as well as clinical opportunities to prepare students for a specialty role and help them develop the knowledge and skills to function as leaders in the complex health care environment. The structure of the MSN program is designed to cater to working nurses. The flexible online classes help them to balance educational goals with personal and professional commitments. The extent of the campus visits and clinical requirements will depend on the program and focus. Also, the clinical requirements are an essential part of the preparation for an advanced practice role. Graduates of the program may be eligible to take a national certification exam for state licensure in the role and employment in a variety of healthcare settings. Nursing is a dynamic and rewarding profession. It provides unlimited opportunities for growth and development through ongoing education. Registered nurses who want to gain advanced knowledge and experience to thrive in the evolving healthcare environment can enroll in the MSN program to improve their critical thinking, leadership, and communication skills and assume an advanced practice role. By the conclusion of the degree, students will be able to provide and improve health care delivery from an advanced practice perspective, lead out in the designing, managing, and implementation of care in various settings, use their knowledge of population-based care to provide culturally sensitive care, demonstrate proficiency in an advanced practice role, and influence the formation of health care policy. A bachelor’s degree is the common requirement for enrolling in an MSN program. However, there are other tracks, as outlined below, that will help you to achieve your professional and personal goals. RN to MSN: The RN to MSN program is designed for registered nurses who have a history of academic excellence and want to earn a master’s degree in nursing in an efficient and cost-effective manner. This accelerated route to the master’s degree may include the option to earn a BSN degree once the requirements have been met. Students will complete the required BSN courses, supporting courses, core MSN courses, and nursing specialty courses. The RN-MSN requires completion of 65 to 75 credit hours. Graduates may be eligible to sit a national certifying exam based on the nursing specialty. Direct Entry MSN: The direct entry MSN is designed for registered nurses who hold a BSN degree. The degree requires completion of 32 to 38 credits, which can take 18 to 24 months. From the onset, students delve into the core MSN courses followed closely by the specialty courses. The curriculum covers advanced scientific principles, communication skills, leadership development, and creative and critical thinking. A key part of the curriculum is the hands-on practical experience in clinical settings, which can cover 525 to 650 supervised clinical hours. Graduates may be eligible to sit a national certifying exam based on the nursing specialty. Post-Master’s Certificate: The post-master’s certificate in nursing prepares nurses who hold a master’s degree for practice in another specialty. Students receive the advanced knowledge and practical skills to provide expert care in their chosen field of interest. They are prepared to meet the challenges within health care with their understanding of ethics, research, cultural diversity, and specialty knowledge. Accreditation Commission for Education in Nursing (ACEN) and the Commission on Collegiate Nursing Education (CCNE) are the primary accrediting associations. Proof of excellent academic record and an unencumbered registered nurse license are also common requirements. Additional enrollment requirements may be necessary based on your field of study, point of entry, and previous education. Completing an MSN program is a major investment in your future, so it requires much planning and budgeting. Even before you begin your search for the right school, you should overturn every stone in an effort to finance your education. There are numerous options for financing a graduate nursing education. Start with your employer, as there may be education benefits. Student loans are another option but be sure to submit your FAFSA application early. The American Association of Colleges of Nursing maintains a current list of financial aid options for nurses. If you plan to join the short list of nurses committed to educating the next generation of nurses, you should look into the Nurse Faculty Loan Program that provides loan forgiveness for nurses who complete the MSN degree to qualify for nurse educator positions. Tuition at the University of Nebraska cost 531.50 per credit hour for resident students. A completed application. Fill out the application completely. Write N/A if a question does not apply. Proof of age using a driver’s license, birth certification, school transcript, US State ID or similar documentation. Proof of lawful presence in the United States. Proof may be verified using a US Passport, American Indian Card, Certification of Report of Birth, Certificate of Citizenship, Alien Registration Receipt Card, Form I-94, or similar document approved by the Board. Official copy of your transcript indicating completion of a master’s or doctorate degree in nursing respective to your requested area of practice. The school of nursing must submit the documents directly to the Board of Nursing. Verification of passing a national credentialing exam. The certifying agency should send verification directly to the Board’s office. Active professional liability insurance. You attest, on the application, to having personal or employer-provided liability insurance before beginning practice. A completed Transition to Practice Agreement – available in the application packet. Complete this agreement if you have not practiced a minimum of 2000 hours following graduation and initial certification in one of the four advanced practice roles. If you do not have 2000 practice hours and do not submit the Transition to Practice, you will be issued a temporary license. Verification of active RN licensure if your primary state of residence is a Compact state other than Nebraska and you have a multi-state RN license in that state. Purchase a verification report at nursys.com and include a copy of the receipt with the completed application. If you have an inactive RN license in Nebraska, you must submit a reinstatement application. Complete a criminal background check by fingerprint. The fingerprint cards are available at any State Patrol office or law enforcement agency in Nebraska. Complete the fingerprint card and sign only after the law enforcement officer has verified your signature with the form of identification provided. The fee for fingerprint processing is $45.25 and may be paid using a credit card online or via check or money order and mailed to the Nebraska State Patrol. Fingerprints may be processed via Live Scan or Ink and Paper Finger Prints. The State Patrol will not initiate the Criminal Background Check until the Board receives the APRN application. Verification of Advanced Practice licensure. Submit the APRN Licensure Verification form to your original state of licensure to be completed and sent to the Nebraska Board of Nursing. There may be a fee for the verification. Temporary permits issued for 120 days but may be extended for up to one year with the Board’s approval. The permit is available for graduates who have not received results of the examination, candidates who are authorized to practice in an advanced practice role in another state, and applicants who need to complete the clinical portion of a reentry program or supervised practice as part of continuing competency activities. The authorization to prescribe is included by default with the licensure to practice as an advanced practice registered nurse. Nurse Practitioners and Certified Registered Nurse Anesthetists may prescribe controlled substances from Schedules II to IV. Certified Nurse Midwives can prescribe Schedule II controlled substances. APRNs who plan to prescribe controlled substances must contact the Drug Enforcement Agency to obtain a federal controlled substance registration. All APRN licenses expire on October 31 of even-numbered years. The Board will send a renewal notice in August of the same year. You must renew your license before the expiration date, or you will be subject to a late fee of $25 to renew your license. The renewal fee is $68. If you do not wish to renew your license, check the box on the renewal notice to place the license on lapsed status. Completion of at least 40 contact hours of continuing education in the area of specialty during the last renewal period. At least 10 of those hours must be in pharmacotherapeutics.